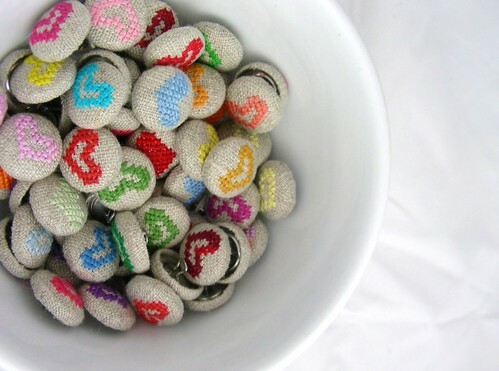 I just had to share this bowl of sweet hearts with you! 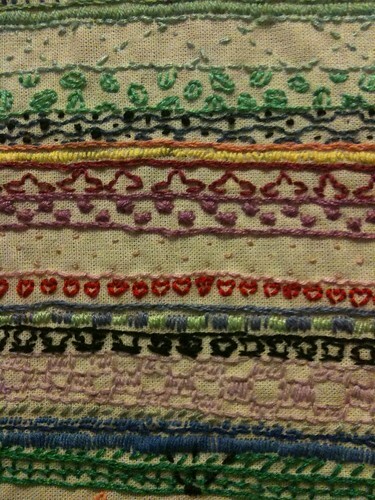 You can see more of Deep Indigo’s rainbow heart embroidered buttons here. 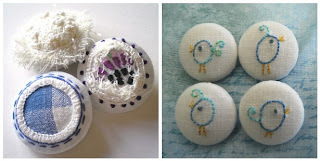 There is one more FeelingStitchy blogger to re-introduce. Although I suspect she requires no introduction at all. She is of course Floresita. 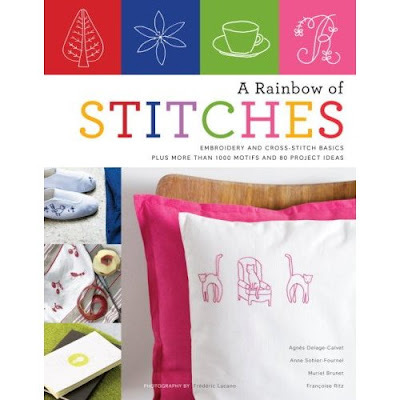 She is the founder of Feeling Stitchy and the reason we are all here. 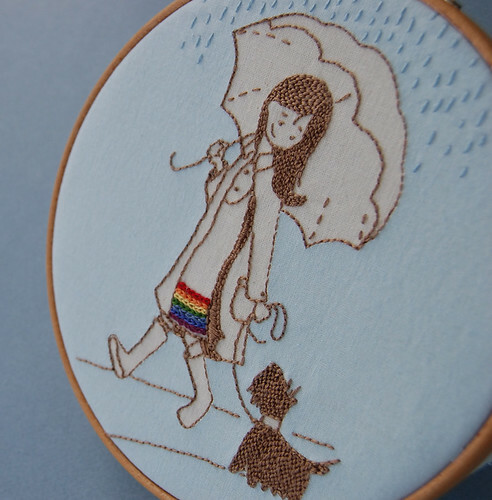 Apart from spreading the stitchy love here and in her own Flickr stream, she also writes a wonderful blog, things I've made, which is an inspiring collection of her art (that's right, she's not just a talented stitcher! 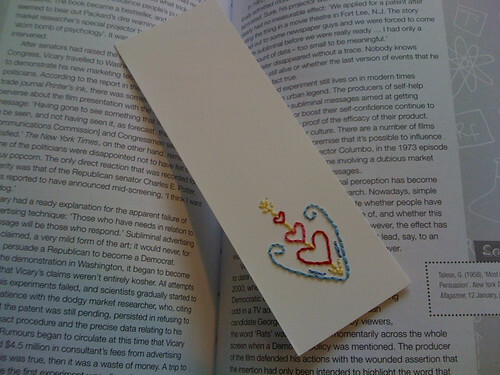 ), crafty stuff and great photos. Thank you for having us all here, Floresita! 3371 - I always use it in place of black for any hair - love how it looks with 321 and dark, bright pinks and apricots. 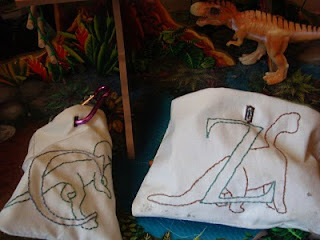 The embroideries I did last Christmas. Simple, textured, sweet. I love to look at them. Let's see - mostly, it's all of you guys! 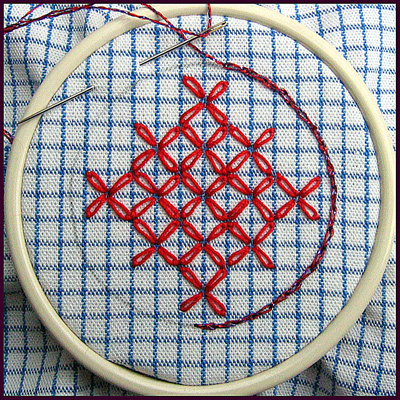 Everything I see in the Flickr pools, Craftster, on blogs - I love to see what everyone is making, thinking about, loving, etc. 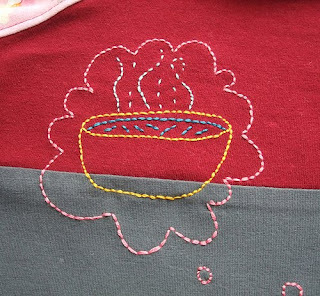 ... from this freehand embroidered soup bowl in a dream bubble! 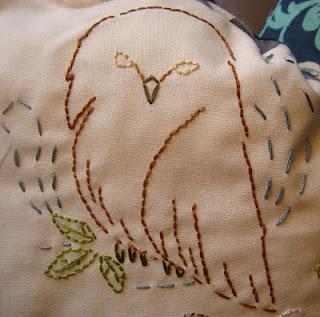 On her blog Beth shares details of this Yeti Dreams of Soup project. Okay, when I say Strawberry Girl, I immediately think of Siouxie and the Banshees and get all nostalgic for my teen years during the 80's. This cute little strawberry girl is nothing like the punk goth one in my head. 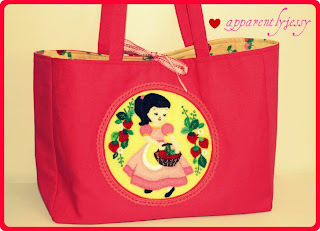 I just love this totebag. It's the cutest! 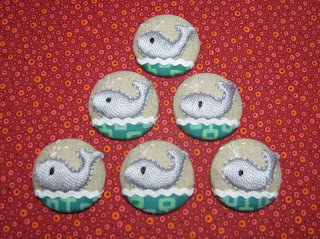 You can check out more of apparentlyjessy's work on her blog-she has cupcakes! 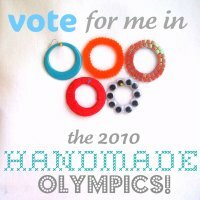 Don't forget to vote for Feeling Stitchy as your favorite blog with a handmaking focus in the 2010 Handmade Olympics! Why do you blog? I blog as a way to share the things I create with people who I feel can both appreciate my work & the steps I am taking as I develop my skills, as well as who can inspire me by sharing their work in return. 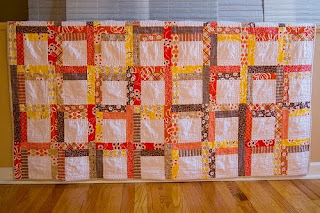 Because the online crafting community is so rich with talent and innovation, I want to contribute to the shared pool of content as much as I withdraw from it (and I make a LOT of withdrawals!). That way, I hope I can encourage others to branch out and try new things in the same way that I have been encouraged and supported by my fellow bloggers. 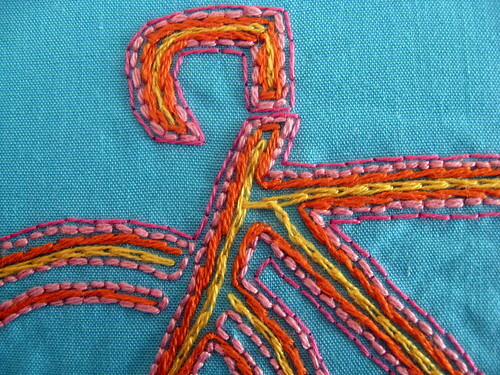 How has blogging influenced your creating? For me, it's quite simple: I wouldn't be blogging if I wasn't creating, and I wouldn't be creating if I wasn't blogging. 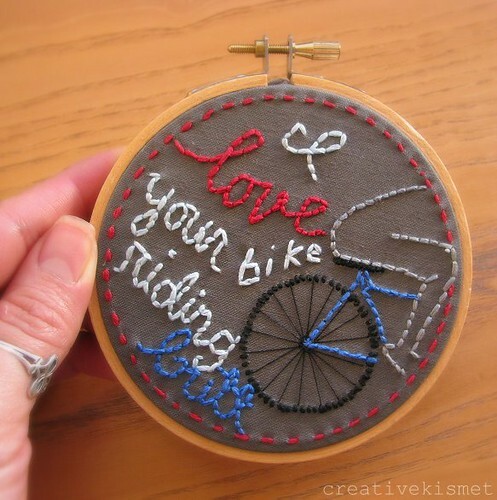 Connecting with like-minded crafters around the world has been the fuel in my tank when it comes to inspiration for new and varied projects. So what are you waiting for? Time is running short ... jump on over and vote today! 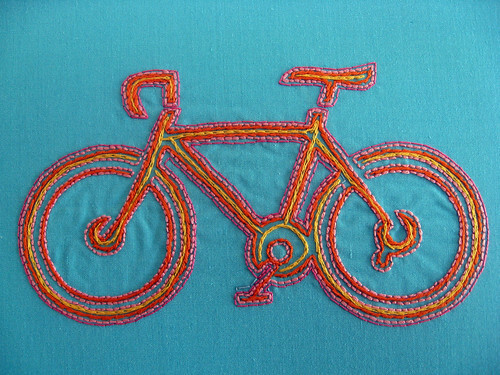 This wonderful bit of stitching turned up in the Sublime Stitching customer gallery by Cate Anevski. Too sweet not to share here! 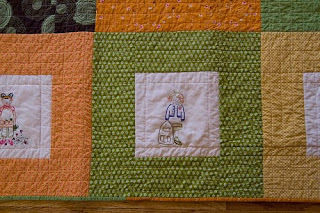 Jessie, or sweetjessie, as she is known on Flickr and her blog, is a truly sweet crafter with a beautiful sense of color and pattern, and a talented stitcher. 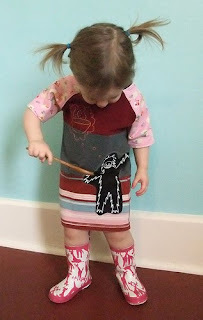 Lucky for us, she continues to contribute to our blog and we can expect many great things to come! Thanks, Jessie! 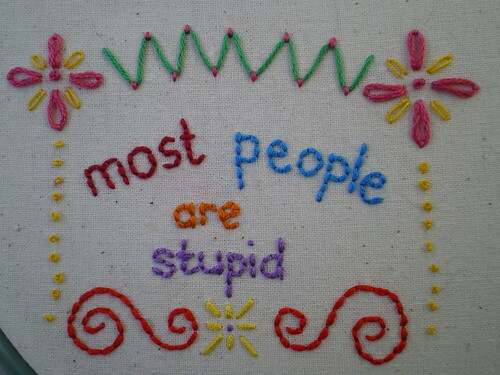 Your favorite embroidery project? 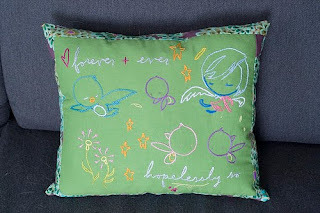 I think my favorite project ever was embroidering a drawing my son made (above). I loved his choice of color, and how much care he obviously put into it. 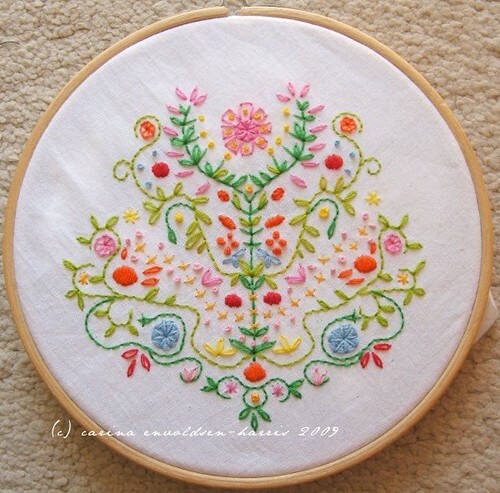 It was a joy to recreate in embroidery floss. Your inspirations? 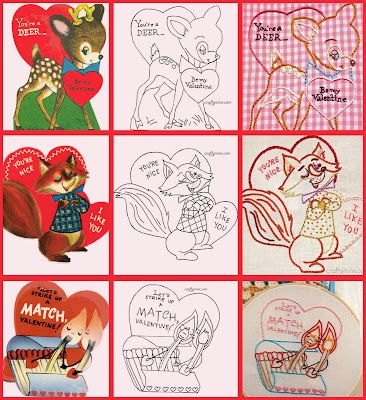 I'm inspired by so many images from the 1940's through the 60's - vintage children's school books, coloring books, paper dolls, candy colors, and sweet things! 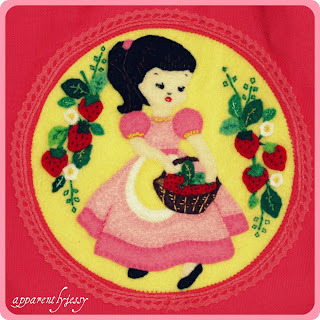 Most often, it's the vintage embroidery patterns themselves that inspire me. 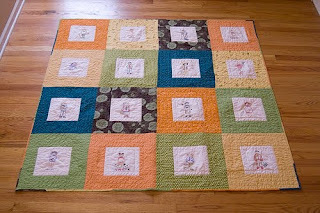 A few more re-introductions are in order this week as we celebrate all the new and current bloggers on Feeling Stitchy! Next is Carina, or Wardi, as she calls herself on Flickr. Her blog has always been a huge inspiration to me - she is an artist with a gorgeous sense of color and unbelievable energy for creating. 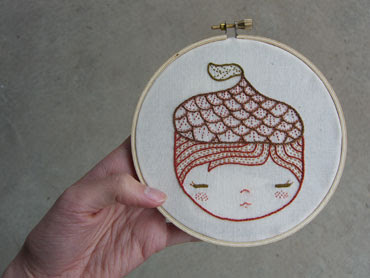 She has a shop with beautiful, elaborate patterns like the one above, and she is always up to something new. It's an honor to have Carina with us! 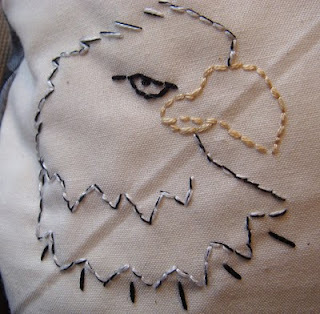 Your favorite embroidery project? 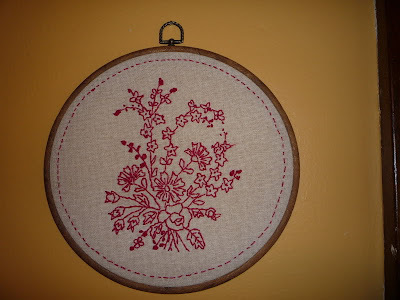 Tree of Life (above), one of my first patterns. Your blog and shop url? Wow! It's great to be here. 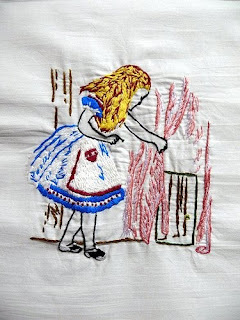 My name is Jo, otherwise known as Mrs. Lacer and I will be blogging here on Feeling Stitchy, every Sunday, about new (or relatively new) embroidery patterns out there. 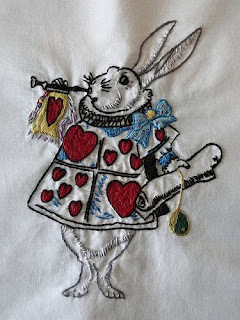 One of the many things I love about embroidery is how many great embroidery patterns are being created; both commercially from small businesses and independent sellers and as lovely freebies from the embroidery community as a whole. 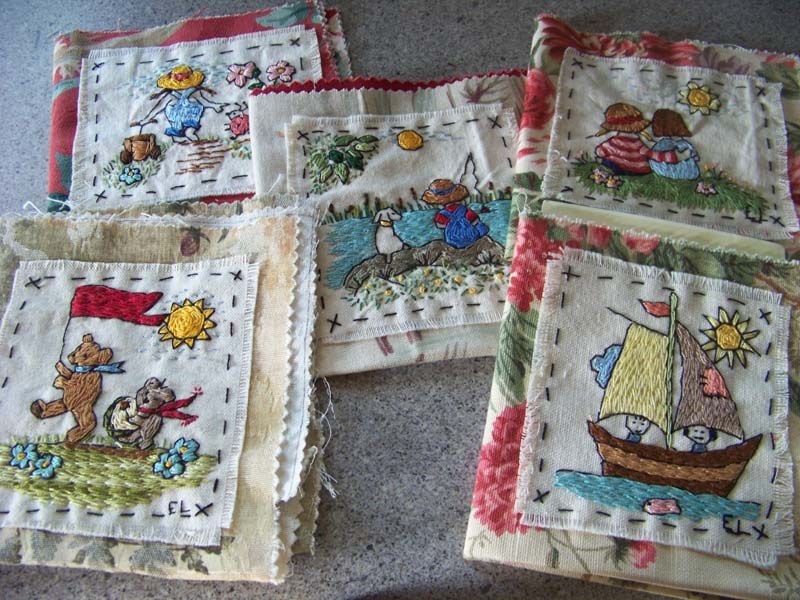 So, my aim is to highlight at least one new commercially available pattern and one new free pattern a week. 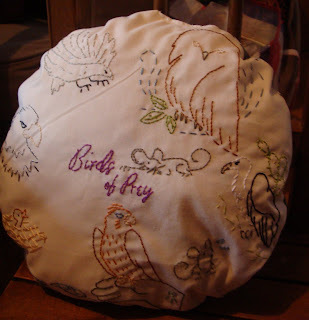 To start off, I thought I'd go for a bit of a bird theme, I've had fun this week embroidering patterns from Etsy seller revidevi, who is currently holding a 'Buy 3 Get 1 Free' sale. Her patterns are sent out as .pdfs. The .pdfs I received were all seven pages long and featured the design repeated in bold line, reversed, reduced and with colour suggestions. 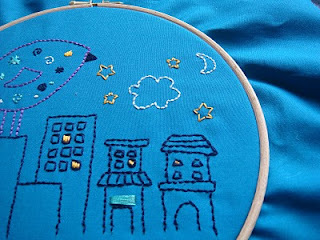 I've already embroidered revidevi's Birdncity design, the city buildings beneath the bird were very fun to do and I'm currently embroidering Weird Tree and Birds, which has some fantastic curves (I don't know about anyone else, but I love embroidering smooth, curved lines!). 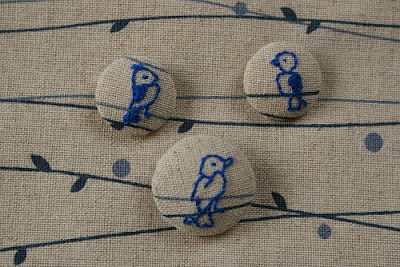 Most of revidevi's designs feature birds and / or trees, so definitely a pattern shop to check out if you like those sort of things (I do!). 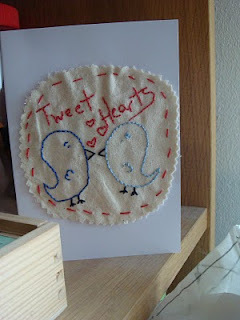 Now onto the featured free pattern; I found this one specially for those still searching for some Valentine's inspiration; Sibling Craftery have a lovely sheet of free embroidery designs, specially for Valentine's Day, featuring lots of different hearts, a pair of cute dogs and these two 'tweet hearts', which I've embroidered up for my husband's Valentine card! 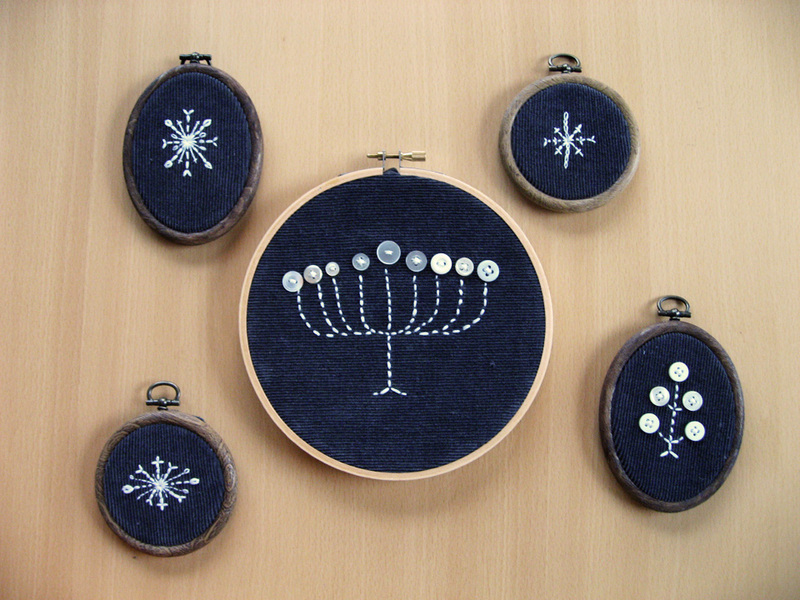 Jo, or lacerslife, as you may know her on Flickr and her blog, is an embroiderer with an eye for the unusual, as you can see in her science-inspired projects. 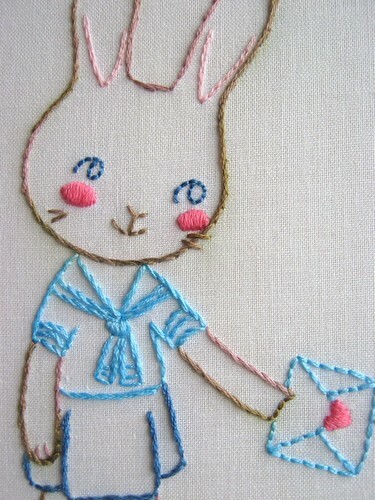 She'll be keeping up with all the embroidery patterns out there, and showing us what's new! Hmmm, tough one. I go through phases, for example, when I opened my Etsy shop (Mrs. Lacer’s Attic), my work was going through pretty much a brown phase, nearly everything was brown, so much so, that by the end of the big rush of work I did, in preparation for getting some stock together to open my shop, I was utterly sick of the colour! But I think at the time I was, it being November, quite influenced by autumnal colours. However normally, I think I have to assume my favourite floss colour is blue, particularly muted blues, that look like they’ve been around for a while. 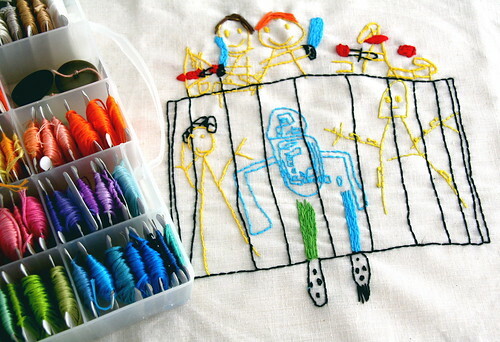 I came to that conclusion, after recently grouping my floss supplies into colours and discovering I had way more blue than anything else! I’m afraid I can’t give you a specific DMC floss colour though, as being here in the UK means that I tend to use more Anchor floss instead. 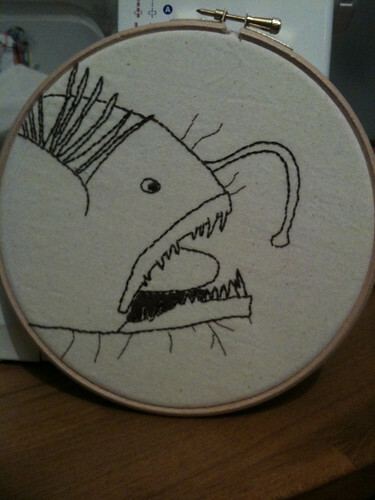 My current favourite embroidery piece is my angler fish (I’ve attached a photo). My favourite has a tendency to change over time though! Small details around me would sound really vague, but it’s true, I’m fascinated by the veins on a leaf or the banding on a snail shell. 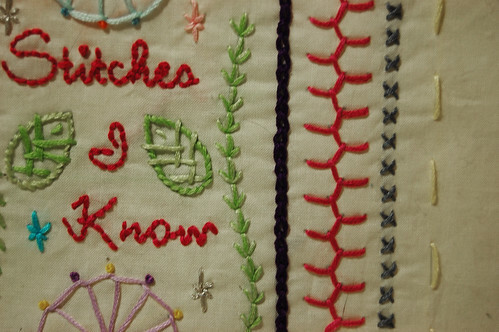 Other than that, like my favourite colour, I go through phases, I’m currently fascinated by the different ways you can embroider lettering, how font chosen obviously effects how the embroidery turns out but also how one choice of stitch may go with one style of writing and another choice of stitch will go with another. 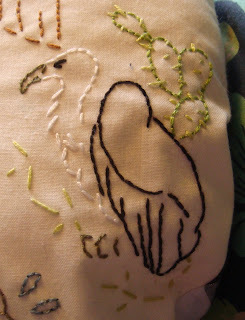 I’m also getting more into exploring my scientific background (before having kids I was a biologist) and I’m attracted to the idea of embroidering biological specimens. 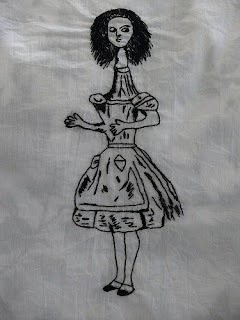 My other big inspiration is my daughter and I love embroidering for her, she’s 6 years old and my biggest and most demanding ‘client’. 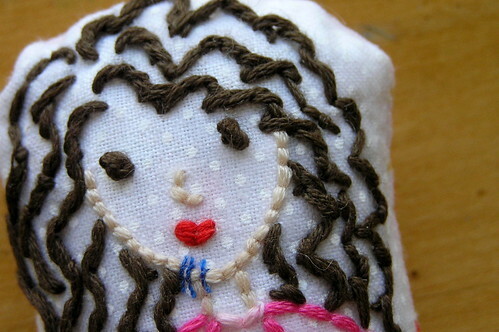 She is fascinated by the work I do and loves it if I embroider something for her or her friends. She likes to examine my work closely and will quiz me on what stitch I used where and will often makes suggestions for what she wants. 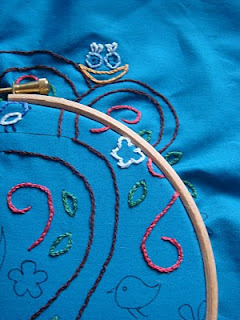 Her favourite stitch she likes me doing at the moment is satin stitch, this was after I embroidered her some satin stitch flowers, to which she said, when she saw them, “I like those, they look hard!”. 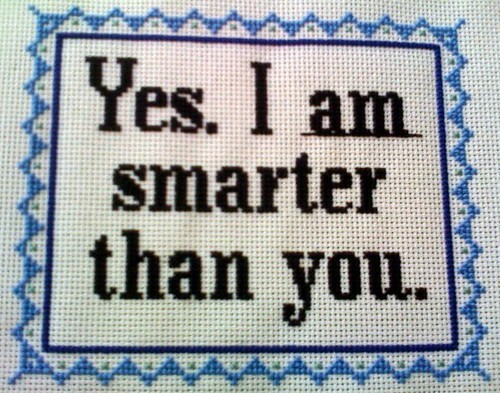 Your shop and blog url? 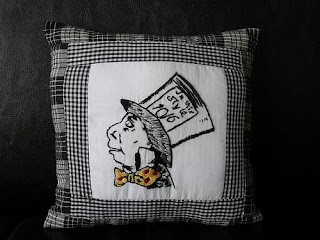 My shop, which is still relatively new, is where I sell hand embroidered pieces, it’s called Mrs. Lacer’s Attic and it is at http://www.etsy.com/shop/lacer. 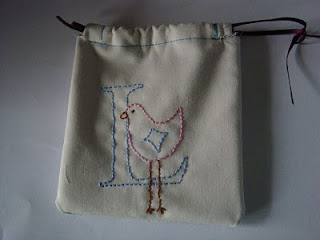 My blog, Lacer’s Life, is at http://lacer.wordpress.com/ and is where I talk about craft, writing, cooking and general family life! 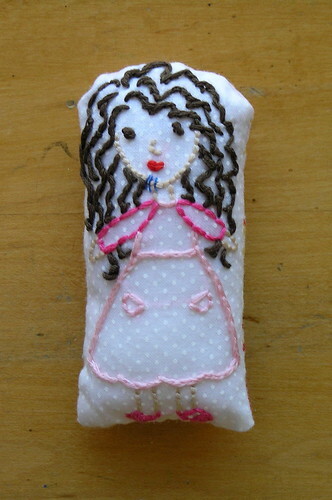 I swap occasionally on Swapbot, I like to do fabric based ATCs or Aranzi Aronzo dolls!